There are a lot of trends that I make up my mind pretty quickly about. For example Anthro instagrammed a picture of Tevas last week and I'm certain that I will not be on board with that footwear trending again. Birks? Yes. Tevas? No. But every once and I while something trends that I'm on the fence about and eventually I'll end up trying it. Recently that has been leather legggings. I just don't know about them. I snagged a pair with my Chicwish order a few months ago and guess what? They have been sitting in my closet for the last two months. I tried to wear them multiple times but every time they went back to my closet. But I decided enough is enough. I'll either wear them or get rid of them. So I did my best to style them in ways that fit me. And I think I've figured out my thoughts about them. When styling leather leggings I think a great place to start is pretending they are black denim. 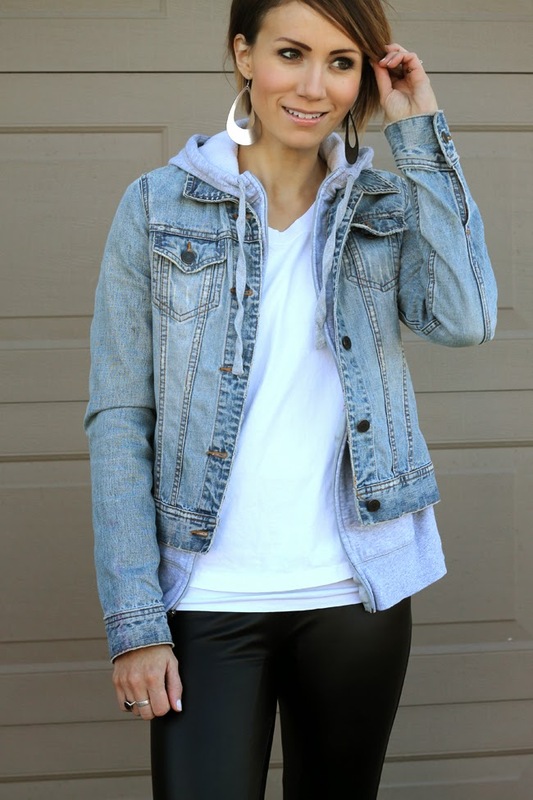 I love pairing a tee and a hoodie and a denim jacket with black denim, so I tried pairing them with black leather leggings. And I think it works. The tee needs to be long enough to cover your behind and this one could be a little longer. The Converse work to further dress down the leggings. These specific leggings I have mixed feelings about. They are fleece lined, which is soft and cozy, but I think they add thickness to my legs. I would feel slimmer in them if they weren't fleece lined. Also the shiny factor really can also make your legs look thicker. The more matte finish, the better. And last of all, I think the more expensive the leather leggings, the better off you will be. They need to fit really nicely- and if the can hug the right curves like nice denim does- then even better. I'm still on the hunt for favorites. I have two more outfits that I'll be sharing this week for alternative ways to style this tricky item so stay tuned. Have you found the perfect pair of leather leggings? How do you wear them? I want a pair so badly, but I haven't found any in my price range that are flattering on me. Your outfit is really cute! I love the leather leggings! I got a pair from Express and they are as matte as can be. Worth the money if you love the leather legging look! At first I wasn't sure because I figured I could only wear them dressed up but when I got them I realized I can wear them while chasing after my little girls during the day! I pair mine with a blouse and heels for dressy occasions or dress them down with flats and a long t shirt and cardigan. I am always nervous about wearing leggings that are so tight around the boot-ay so I make sure to cover it. Love your look! These look amazing on you! Absolutely love the whole outfit! I was shopping with my hubby, and wanted a purse. So he said if I wanted the purse I had to put on these leather/pleather leggings. And I did. And they fit better than I thought they would. But the part I couldn't get past was how it felt like my calves were being strangled. They were so tight there. My hubby laughed and laughed. Needless to say, they stayed at the store. Yay! Glad to see you try them. I've had several pairs over the years and my favorite are honestly an $8 pair from forever 21. They are thinner and not too long, super comfortable too. I have a long torso, so I always have trouble finding shirts long enough to cover my backside, so I usually wear them under dresses for church...so much more comfortable than tights! Yessss, I have been excited about this post series! I bought a pair of vegan "leather" leggings a month ago and haven't had the nerve to wear them anywhere! !